It has been a few years since the last Rosetta West CD. Joe is back with a set of mostly acoustic or guitar tracks with mainly only additional other vocals and minimal other instruments. 12 new tracks in 33 minutes. The band is the same as usual with Orpheus on bass, and Nathan on most of the drums but 3 other drummers also pitch in. Joe is playing the guitar and all of the distinctive vocals. 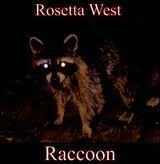 The CD is inspired by Joe's recent interactions with Racoons! The CD starts with Red Light which is catchy. Suzie is probably my favourite track on the CD with a really nice bluesy thread. I don't care is really sung with passion and just guitar, bass, drums and minimal drums-percussion. Sussana Jones has a heavier guitar and real drums but is a quite happy track. Underground features slide guitar and tells a nice story. Me and My Friend is a foot stomping acoustic track for cranking up on the porch, if you have one! River of Days is another acoustic number while The Temple has a cool flangy guitar. Desperation has a totally different style of drumming and is almost like a sort of tribal African thing. Baby Doll has some nice guitar and sections in between the singing. Joe has a unique way of delivering his words into the rhythm of the music. Joe instils a lot of passion into his singing (my ex-wife, does not like him at all) and guitar playing and lyrics. While not my favourite record Joe has made, there are many things to enjoy in these 33 minutes. I am still glad Joe is making new music and these songs make me smile.